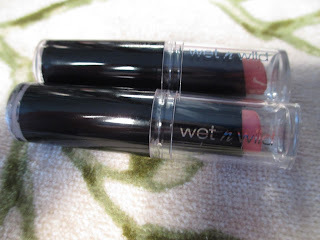 Today I am sharing my experience with two wet n wild lipsticks. I only bought two because I wasn't sure if I would like it. These are only $1.99 at most drugstores. I have the shades Just Peachy and Think Pink. I hate the packaging. When ever you take the lip off it tends to get on the clear cap since it doesn't roll down. I do however like the clear cap. You do seem to get A LOT of product. It seems to roll up forever, so if you find a color you like you won't run out. Here are hand swatches. The top is Think Pink and the bottom is Just Peachy. Think Pink is a bit brighter in real life and so is Just Peachy. Here is Think Pink on my lips. It is what I would say a "perfect pink" is. Not too bright, and not too light. Still a little more than an every day pink though. Just Peachy is a peachy color. A little orangey and not as flattering on my skin tone, but I can make it work. By now you can probably tell I love this line of nail polishes. Most scents are pleasant and exactly like the name, and I think I've tried five now. This one is probably my favorite so far. I found this one for about $4-5 at Walmart. The latest one I bought is Wintermint! Here is a more accurate showing of the color. 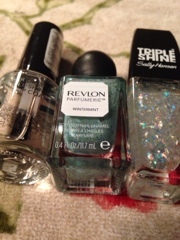 It is a minty sea foam color at the base, and then blue and silver glitter mixed in. Here is is with about two layers. I was about to take it off so I decided to take a pic, it lasted very well for about a week. 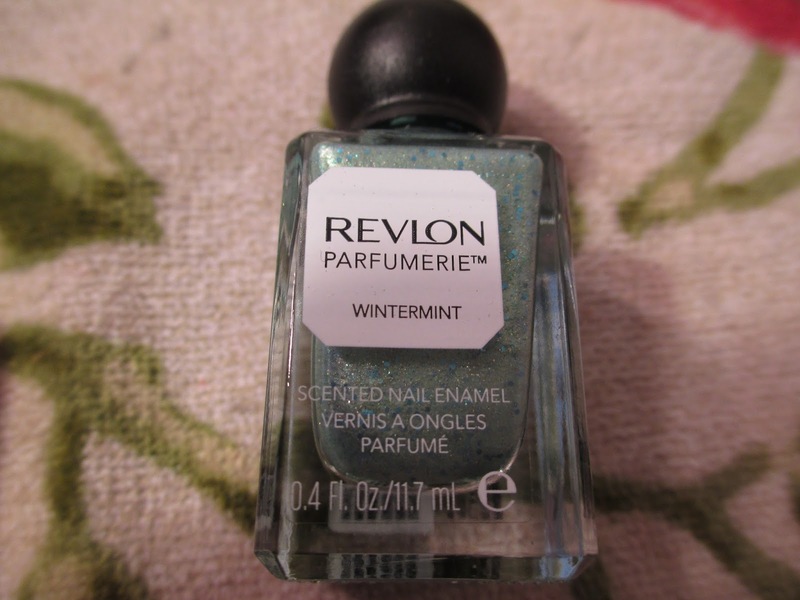 It smells exactly like mint and not just slightly, even after a top coat it still smelled like mint. Another Wet n' Wild eyeshadow review. This is the Petal Pusher Palette. It is a purple themed palette that I bought because I felt like wearing purple eyeshadow and I didn't want to shell out a bunch of money for the stila purple eyeshadow palette. I bought it for around $5 at walmart. 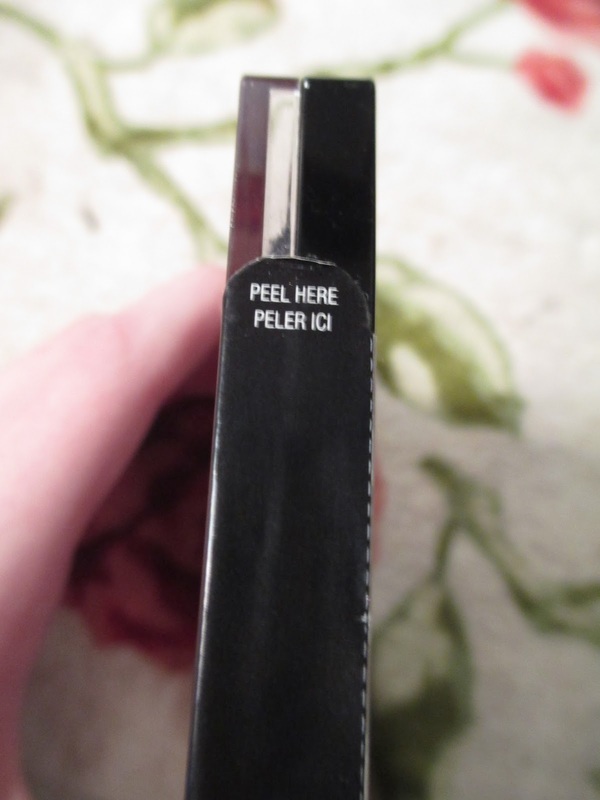 Unlike the trios this had a "Peel Here" tab which I thought was neat. The back tells you a few ways to create looks with this palette. It is very purple hued which I think is gorgeous especially for spring! The palette is not too glittery or intense, and I find it can be pretty wearable. Here are all the shades swatched out on my arm. The left side is swatched to the left. Here is just the left half. 1-The first is a shimmery but not too intense "browbone" shade. So today I stopped at Walmart to look at the new makeup for spring. Not that much appealed to me. The new maybelline wonder powder was mostly dimethicone which breaks my skin out. The Masterglaze cheek sticks seemed ok but they were around $8 a piece. The liquid lipsticks coming out are not my thing, so I'll just show you what I did get. Hello everyone. I have been using this sponge for weeks now and am ready to share my opinion. I took pictures when I first got this sponge so it wouldn't be all gross. It comes in a large tube like box. Saying what it is on this side. And then sharing what it claims on this side. Including how Samantha Chapman from PixiWoo created Real Techniques. It claims to: redefine your skin, as well as belnd makeup for a smooth enhanced finish. It is such a weird shape. It has a dip to apply to apply onto the rounded surface and contours of the face. Here is is compared to other sponges. I am in the process of finding a perfect one since I am not willing to pay $20 for the beauty blender, since they get worn out fast if you use them everyday. The others I bought for $4/5/6 dollars at TJ Maxx. 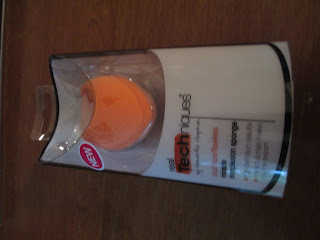 Today I am reviewing another product from Rimmel. It is a "lasting finish" or supposedly long lasting lipstick. I have the shade 17. It is a neutral wearable pink. This retails for around $6 and can be found wherever Rimmel London is sold. 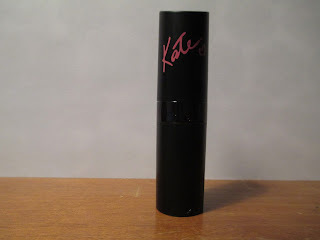 It is a black tube with kate and a pink heart in pink writing. The tube is not standard it is slanted which makes it hard to store. You get a standard amount of product that rolls up as well as down. Up close you can see a subtle glitter that doesn't show on lips until after the color is worn off. A light swatch makes it a pale sheer pink. When you build it up is comes out to the color in the tube. When wiped away you are left with tiny specks of glitter. It is very rosy and wearable. A classic pink, not bright or too pale. It does transfer within the first while of wearing. Which means check your teeth before leaving the house. This is a youtube tag going around but I thought I would share on my blog. I know that this is really really late but I have been trying some new things lately but these are my overall whole year favorites. 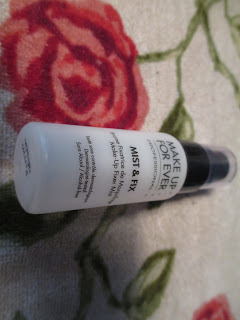 Makeup Forever Mist & Fix: Silicone primers break me out but this is a setting spray without silicone and it helps get rid of the powdery look while not looking matte or dewy. It can also be used before makeup to help setting power as well. Revlon Colorstay: (Oily/Combo): I prefer this sooo much to the covergirl outlast. This lasts so much longer and covers more. L'oreal True Match Crayon Concealer: I have still not found a holy grail concealer but this is pretty good. I can use this under my eyes, face, and for a slight highlight. It can get a bit cakey on blemishes but works well for under eyes. Rimmel Stay Matte Powder: I used this most of the year and this is my second one. It can be a little too mattifying but it does provide a little extra coverage. 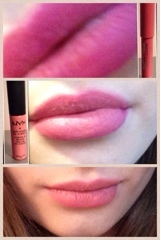 Today I am going to show you my currant favorite Lip combo. It's spring like (can be worn year round though) and very easy! I originally thought of this to tone down my bright pink lip, but it turned out ombre and beautiful. Here is the picture I posted on Instagram (my IG is budgetmakeupbeauty). I listed the steps there as well. STEP 2: Use a lighter shade of pink. This could be in the form of lipstick, balm stain, or in my case lip cream. This is the soft matte lip cream in Istanbul. ( I also have a full review on this).